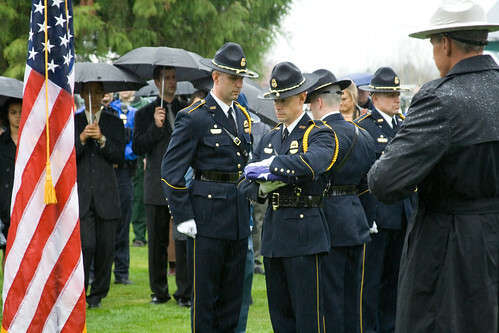 An Officer's Funeral, originally uploaded by The Bacher Family. In March 2007, Officer Shane Wyrsch was killed while on duty by a drunk driver. Because he worked for the U.S. Forest Service and I work for the adjacent Mount Rainier National Park, I was asked to take photos at the funeral. This is one of my favorites. This photo is posted today in honor of the four Lakewood police officers killed in the line of duty this past Sunday. Our thoughts, prayers, and deepest condolences go out to the family and friends of Officers Greg Richards, Tina Griswold, Mark Renninger, and Ronnie Owens.